NIU Naperville Weddings and Social Events NIU Naperville Center is a modern, elegant location that provides the perfect setting for you and your guests to celebrate. From the moment you enter our sunlit, spacious atrium to your last dance in our stunning event space, you'll create memories that last a lifetime. From ceremony to reception, we help you create the perfect event no matter what your wedding style, theme or budget. NIU Naperville partners with several hotels to provide convenient sleeping arrangements, some directly across the street. Hotels offer discounted rates and free shuttles to the center. 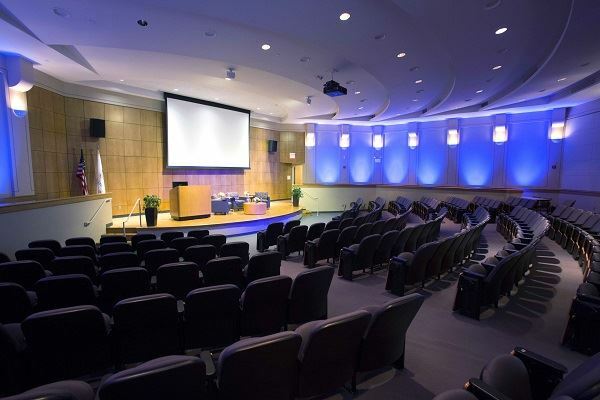 Corporate and Association Meetings and Events The NIU Naperville Center is the ideal setting for corporate and association meetings and social events in the Chicago area. Discover how our 23 sun-lit meeting rooms, complimentary A-V, on-site technical support and catering packages make planning and hosting your next meeting seem effortless. Additional Chicago area locations in Hoffman Estates and Rockford. You never have to be concerned about gratuities, service charges or hidden fees. We also have a no worries reservation policy. Package A | $1,700 Just right for more intimate affairs, this package gives ample seating for up to 50 guests. Package B | $2,100 Created for those with up to 120 guests, this package uses two-thirds of our spacious ballroom yet still leaves plenty of room for dancing the night away. Package C | $2,900 Take full advantage of our 3,750 square foot banquet room. The floor-to-ceiling windows give up to 230 guests a great view of lit-fountain, patio, and the night sky. All Packages Include the following features and services: • Personal special events coordinator to walk you through the planning process. • Spacious banquet room with floor to ceiling windows • Two-story atrium set-up with high-boy tables with adjacent patio for cocktail hour for no additional charge • Round tables for your guests, head table, all the accessory tables you require and our in house chairs. • White linens to the floor on buffet, cake gift, and head tables state-of-the-art AV equipment included projector, microphone, and sound system, mounted projectors, concealed video screens, and internal sound system can accommodate slide shows, background music, and speeches only. • Brick patio and fountain connected to atrium and visible from event space dimmable overhead lighting and LED preprogrammable spot-lighting which can be sound activated by your DJ • Dance floor • Professional setup and cleanup • Uniformed security guard on the premises Please see attachment for additional information.